Custom sizing is required for this product. Please visit our Custom Solutions page to request a quote. Prices start at $690.00. Contact us for project-specific pricing. This non-submersible pump was engineered by API for the express purpose of circulating Glycol through stainless steel tubing to prevent frozen pipes. It suits broad needs for domestic, geothermal, industrial, military, and oil field uses. 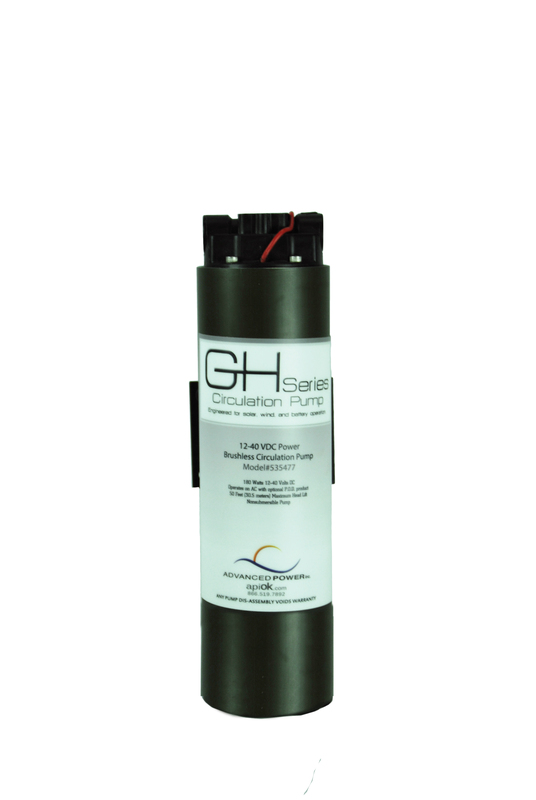 Constructed with CNC aluminum parts for the housing, the GH circulation pump offers greater thermal protection and heat dissipation, which makes for a longer lasting motor. It also offers locking capability to reduce the chance of theft for the pump, battery, and controls. Includes temporary dry run capability and is factory rebuildable. Flow maxes at 2.5 GPM. 12.5-40 VDC brushless motor with internal drive. Anodized for abrasion and corrosion resistance. Professionally built in the U.S.
Includes 5 feet of 14GA-2 conductor pump cable. This pump strictly circulates preheated Glycol. Safe with most antifreeze products. Not designed for harsh chemicals. Self priming up to 8’. Fuse or pressure relief required for pump protection. This product can be customized to suit your exact needs. Contact our sales team.